My extended travels have finally drawn to a close and I am looking forward to a relatively quiet remainder to the summer. This last trip finished off with a personal achievement on Sunday that I am extremely pleased with. I traveled to Missoula, Montana to participate in their marathon along with my son-in-law and daughter. He competed in the full marathon with me and she did the half (she is still recovering from her Ironman). The weather in Missoula was perfect for a 26.2 mile run. It was in the mid-40's at the start before dawn in Frenchtown and in the 70's as we completed the run. 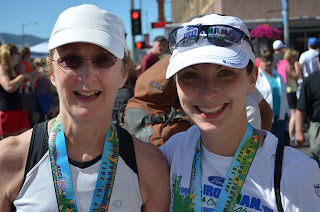 I had a wonderful time, even though everything that could fail electronically for me did – my run/walk timer alarm system failed at the start and about mile 15 my Garmin watch which tells me my pace and how long and far I have run went blank. I just kept running and at the end finished with a time of 4:38 - close to my personal best since I returned to running marathons five years ago and enough to come in second in my age group. I couldn't have been happier! Celebrating with my daughter, Jaye, shortly after completing the course. 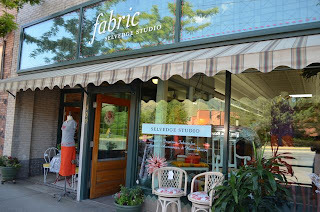 Of course, I did have to also check out some fabric while I was in Missoula. 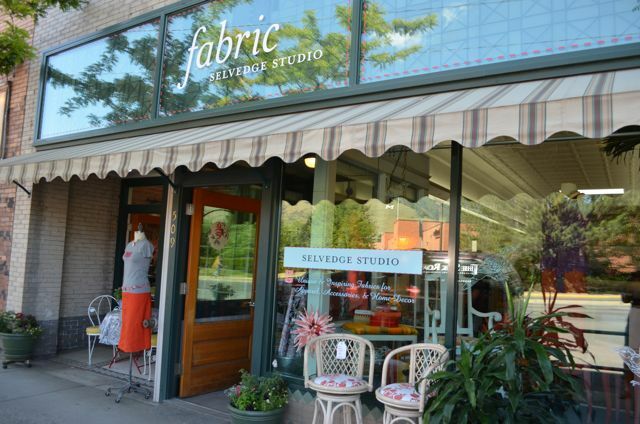 There is a great store right in downtown called Selvedge Studio that carries a host of varied materials. It was great fun to check out and I picked up some black wool fabric from Italy that has the most amazing soft hand. I have been collecting various black tones to use with some sketches of Antarctic penguins that I have been playing with and I am sure that it will work perfectly. All-in-all, these past few months have been a whirlwind of activity. While I still have more exciting travels on my plate come fall, I am really looking forward to just being home with my husband in beautiful upstate New York for the rest of the summer. Congrats on doing so well in the marathon. What a feeling of intense accomplishment it must be! Enjoy your summer. A wonderful accomplishment...well done! Enjoy your summer. Congratulations, Judy! You live such an exciting life! I love the photo of you and your daughter. Thanks, everyone. I just took a week off and am really looking forward to running again tomorrow - just 4 miles though. And, I am looking forward to not having to fit in 20 miles for the rest of the summer. I am so used to fall marathons where the training extends through our summer.